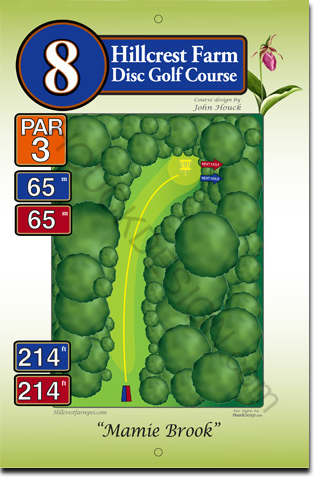 Hole 8 is a par 3, 65 metre hole that runs parallel to the brook, which you can just see downhill to your right. This is a great spot to try out your flick or thumber as the hole curves slightly to the right. Be careful! The basket is positioned downhill to the right, so an overshoot will get you a tough shot back through the spruce trees!